You know what I’m a sucker for? If you said scarves and toast you’d be right, but that’s not what I’m referring to here. 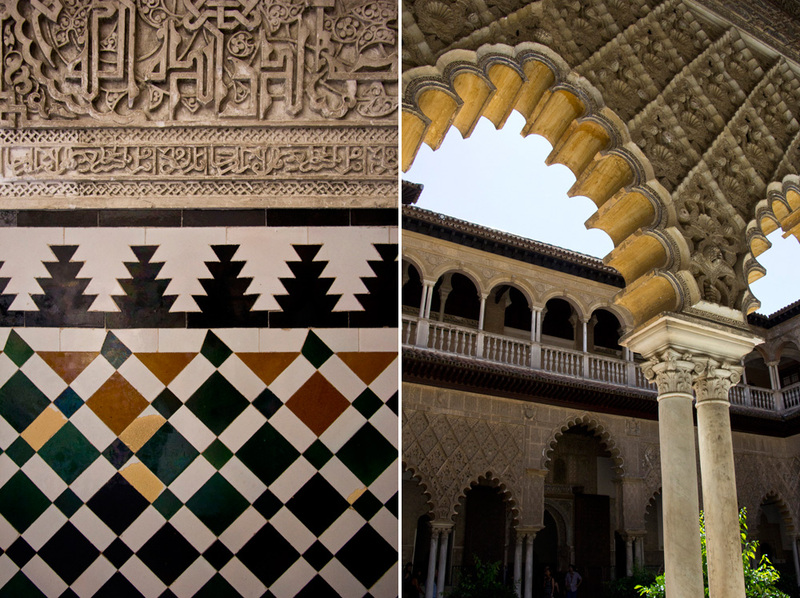 When it comes to architecture and historic places, I’m a sucker for exotic style and TILES. PRETTY COLORFUL TILES. 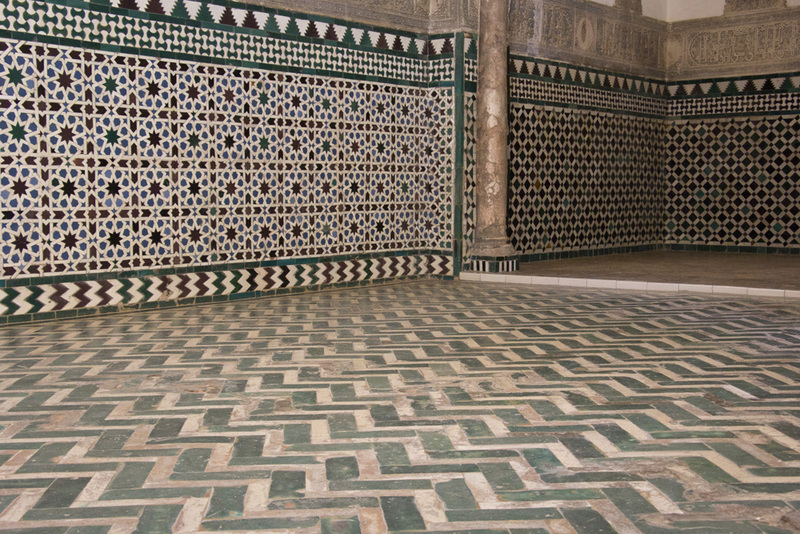 Like the Saadian Tombs of Marrakech, The Alcazar is filled with stunning tilework. Enter Annie and Annie’s giant camera. 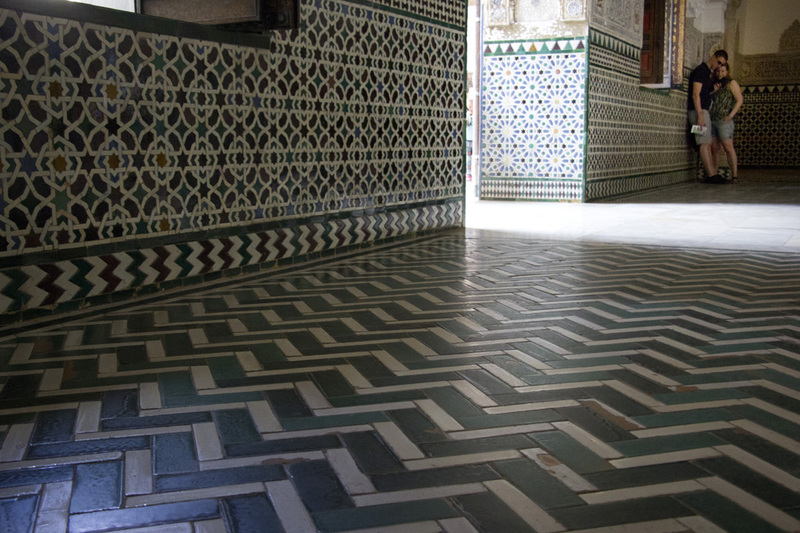 So what is this Alcazar with all the pretty tiles? 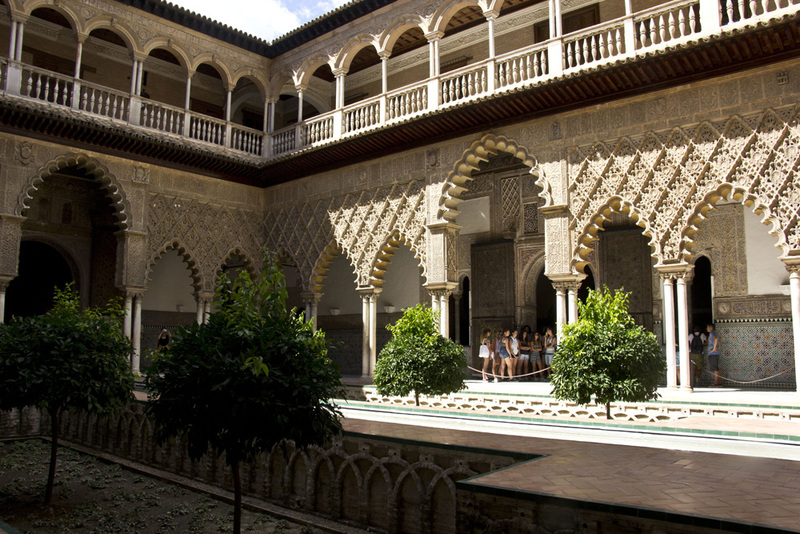 The Alcazar of Seville is one of the most beautiful examples of Moorish architecture in Spain. 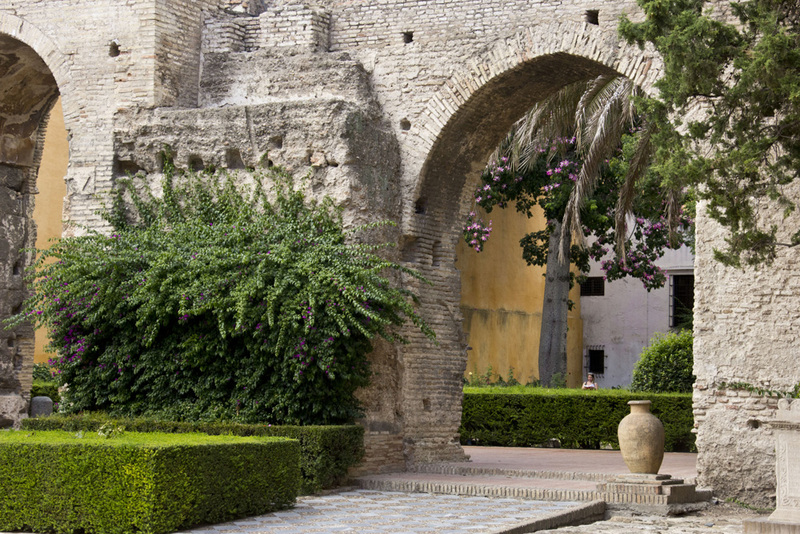 This complex of palaces and courtyards and gardens was built over time by many generations of kings and royal families. It took a long 11 centuries of expansion for it to become what it is today. 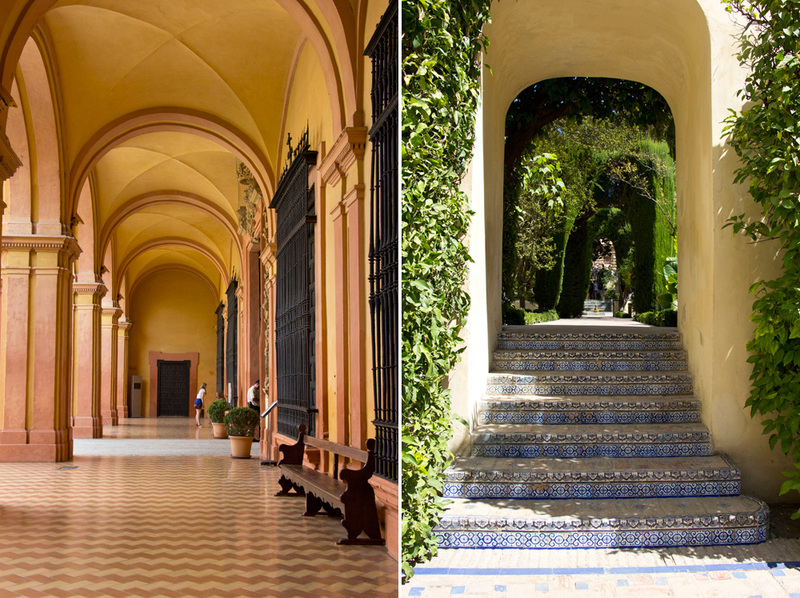 While visitors are able to wander through different buildings with unique architectural styles, it’s the Palace of Don Pedro that is the most stunning. 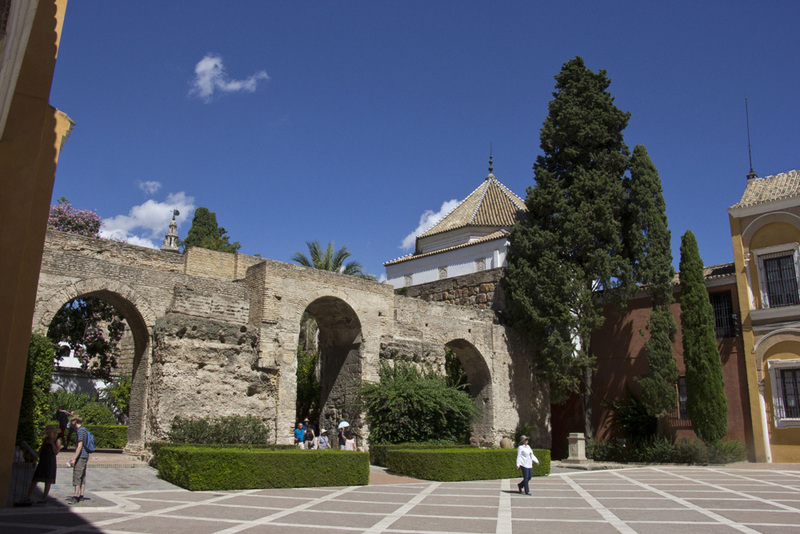 This part of the Alcazar was built in 1364 – more than 400 years after it was first built. 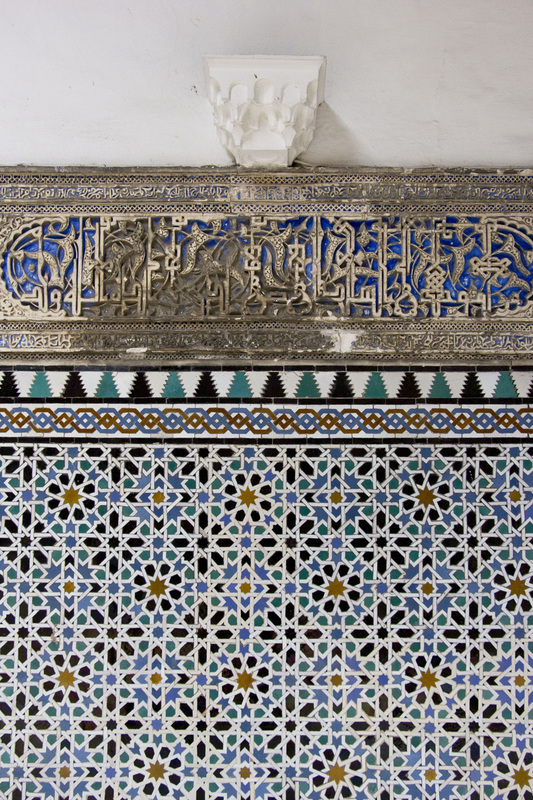 Every corner of the Palace of Don Pedro is decorated in intricate colorful tilework. Every room with a different pattern. 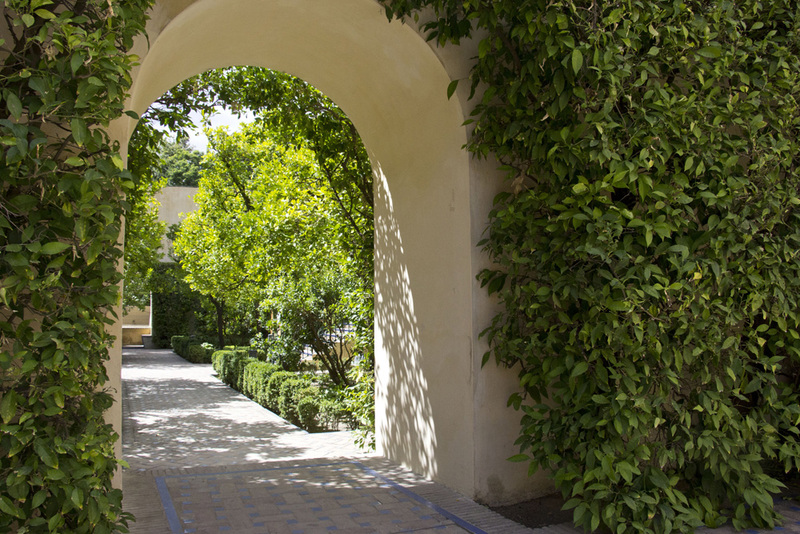 The courtyard – called the Patio of the Maidens – is lined with incredibly detailed archways with scalloped details. 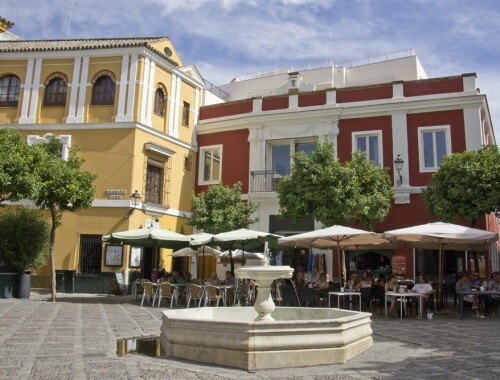 This is the jewel of Seville. I laughed when I thought that something not made of tiles could somehow be better than the tiles themselves, considering how much I love them. 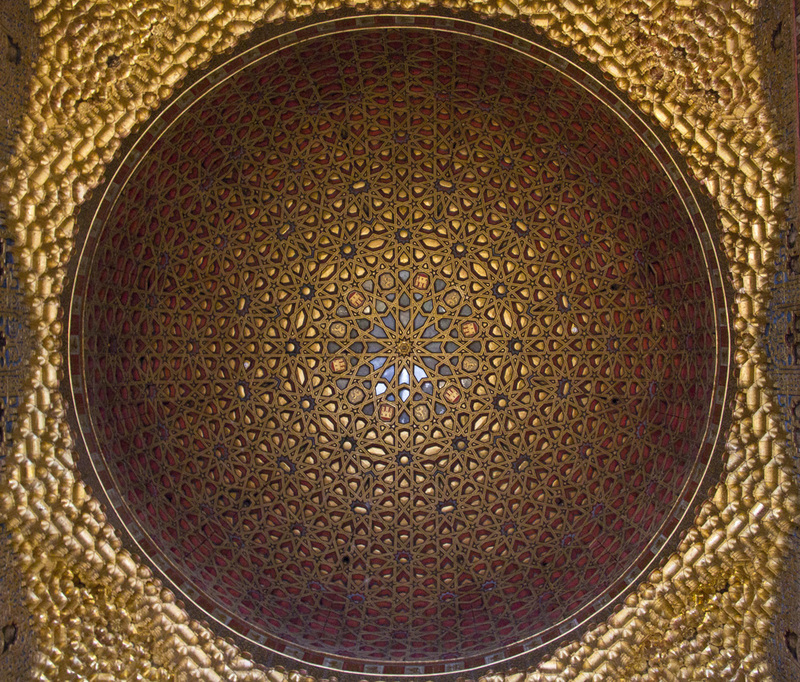 Turns out though that the Alcazar’s showstopper was the detailed glittering dome in the throne room. Located just off the Patio of the Maidens, this piece of art towers above Hall of Ambassadors in all its wooden and golden glory. Interesting tidbit – the star pattern was used to symbolize the universe. All I wanted to do was lay on the floor below this thing and look up. Unfortunately, that’s frowned upon. 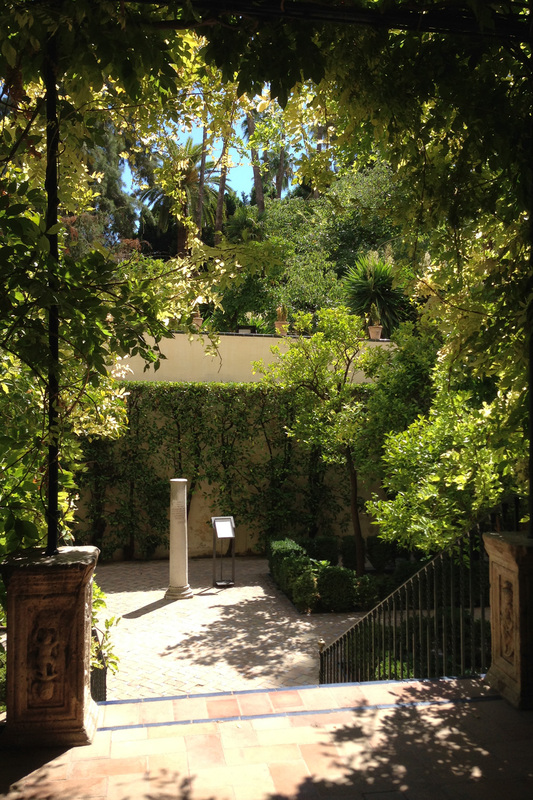 So I had to move on to the gardens. Bougainvillea in all the right places, of course. 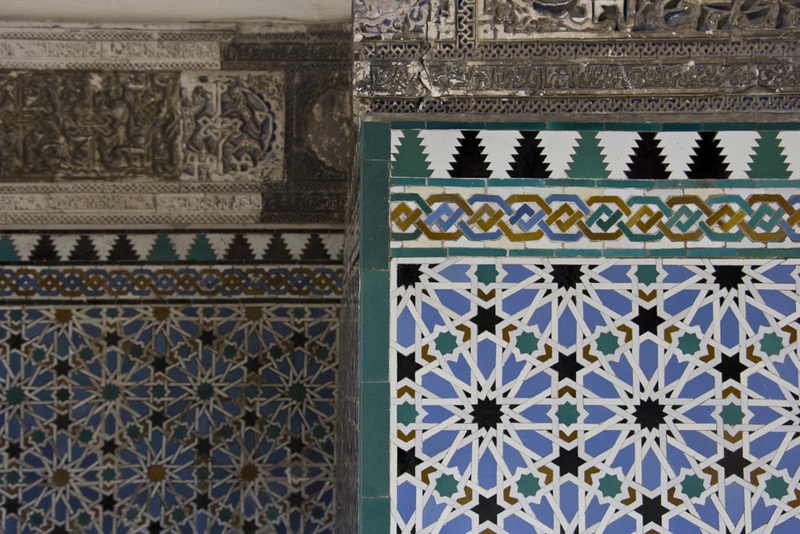 And more archways, star patterns, and (you guessed it) TILES. 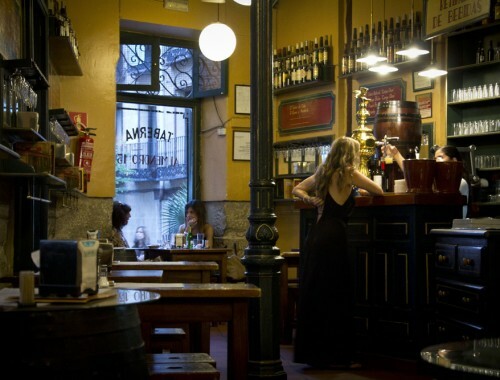 Seriously – if you go to Seville, you cannot leave without visiting this place. 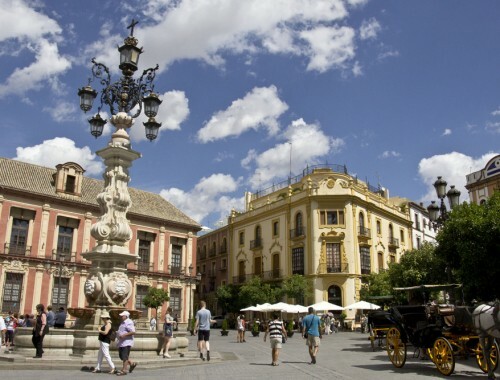 Tile work and domes and gardens aside, its history is an important piece of Seville’s past and should be visited in order to better understand Southern Spain’s Moorish culture. But if you find history and all that good stuff kinda boring, GO FOR THE TILES. They really are so beautiful – I promise it’s not just me. lets go back. k thx. What a stunning place! I could take photos there all day!!! it really is stunning. 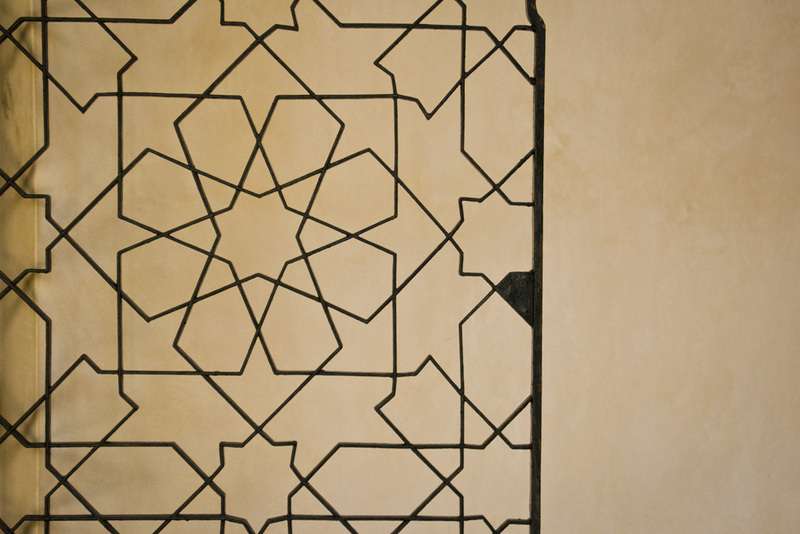 love that tilework!